The traditional concert format has been passed on to us from the late 19th Century, but we now live in the 21st Century. We are not in church, and I am not a priest. One has to try to understand the audience. And this is not just the famous American sentence about the customer always being right. Our job is music, and you have to understand what it can mean to todays’ audience. The orchestra must also be convinced of it. Only then can you convince the audience.What can I do for you? Save the Western European musical culture, Mr. Axelrod. Can you help us? I don’t know if I am appropriate for that. I was born an American, now I'm rather an „Ameuropean", not only because I am involved in European music, but also because of my life. You are chief conductor of the Orchestre National des Pays de la Loire, isn’t somebody in such a position in Europe also responsible to save its culture? As an American I am perhaps a little more optimistic, I do not believe that anything needs to be saved. Here in France for each composer there are at least 20 painters, writers, philosophers, sculptors. In Germany it is vice versa. But I also know that, according to a statistic, before the Second World War music was heard or played in fifty percent of all German households. Twenty years later it was apparently common only in ten percent of the households, the number has now probably sunken further still. So I understand the German pessimism, but I think that German-speaking countries still have the best development opportunities. In your work with the orchestra here in Nantes, what are you doing differently from your predecessors? I am not the only one changing the orchestral work, there are many conditions that have changed. I think above all that the conductors have changed. They have become more mobile, have expanded their repertoire and can adapt better to local conditions. In France, when there is a problem, you have to talk a lot: Where is the problem, what is the problem, who is responsible, what is the solution? During a rehearsal one can philosophize. In Germany, the way to the solution is much shorter, a lot happens without saying a word, only with a hand movement, with glances, with gestures. 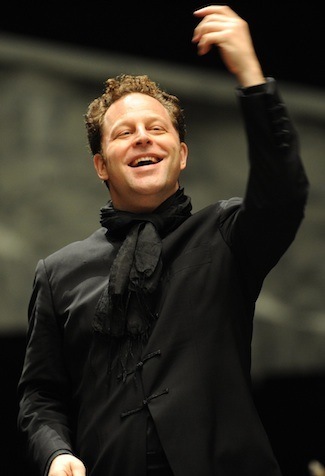 A conductor has to understand the psychological and anthropological requirements of his work. We do not play the music but work with the people who play the music. We direct the people. Yes, sometimes. The relationship between the musicians and the audience is interdependent, and the experience in the concert hall is a collective one. As a conductor I organize it a little like a coach does with a football game. And how do you attract the crowds into the stadium? The Orchestre National des Pays de la Loire has more than ten thousand subscribers in the region, in Nantes, Angers, Le Mans. Here in western France there is a real hunger for music, this is a great stroke of luck. Our orchestra has almost a monopoly. The second stroke of luck: the orchestra has brought me here with the assignment to be chief conductor and program responsible, they let me realize my ideas, they actually expect that of me. We conceive every concert with a particular idea, which can then be followed throughout the evening. Recently we did "Amadeus", a play with music, a wonderful success! We have commissioned a composition to Sergei Prokofievs’ grandson, he lives in England and will compose variations on Schiller's "Ode to Joy", which supplied the text for the final chorus of Beethoven's Ninth. But if you want to have an audience, the first and most important thing is: You must get involved. You have to play as if life and death depended upon it. The audience here in France wants to feel commitment, particularly the younger ones expect this. The second thing is: One must communicate the desire to share the music with ones audience. This has a lot to do with presentation. The traditional concert format has been passed on to us from the late 19th Century, but we now live in the 21st Century. We are not in church, and I am not a priest. One has to try to understand the audience. And this is not just the famous American sentence about the customer always being right. Our job is music, and you have to understand what it can mean to todays’ audience. The orchestra must also be convinced of it. Only then can you convince the audience. Your program "Aimez-vous Brahms?" consisted for example of pieces that make reference to each other formally and historically. Is that the key to your success: to create didactically conceived programs? Absolutely. If one establishes references between the different pieces in a program, there is a greater chance to open the eyes and ears of the audience. I have nothing against this type of didactics, In fact I think that this is my main task. We do not play „school“, we offer a complete work of art. "Aimez-vous Brahms" takes Brahms very seriously. This is essential. But the fact that we started with Webern and ended with Ravel may have shed a different light on Brahms' Fourth Symphony. Does the audience recognize the structural relations that you see between the pieces? I think so, at least in part. We have open rehearsals, and I talk to the audience in the same way as I do with the orchestra. It is important to show that we are doing a job in the publics’ interest and that we are personally involved. If I go to the bakery in Nantes, it is possible that the baker says: Maestro, I am coming to your concert tonight! Or in a shop where our poster is hanging, a saleswoman looking back and forth between me and the poster asks: Do you have a brother who is a conductor? And she is then quite surprised when I say: No, that’s me, and I live here too! Here we are not afraid of coming closer. But to confront musicians and audience in a non-distant fashion can only be one aspect of your musical teaching. Of course. Although the most important task is left to the families. That is why I mentioned the statistics in the beginning. Here in France Jean-François Zygel, with his Parisian "Leçons de musique." has permanently changed the situation of music. But he also depends entirely on the parents, they are the ones that have to create the first positive experiences for children with music. Incidentally, for the upcoming season we have asked Zygel to compose a concert for families and orchestra so that we can compete with reality TV! We can encourage families to take more interest in music, to actively get involved. Family life has now become a very fragmented thing. We mustn’t advertise only for the young audience. We also want the parents and grandparents. That’s the only way you can ultimately be successful. I know by now the sight at our concerts: in the audience, sitting next to each other, I often witness three times the same face, Grandfather, daughter and grandson. This is new. I see this as a proof of the success of our work. Perhaps the French concert audience is easier to impress than the German one? Perhaps. However, it can also be very indignant, as the historical example of Stravinsky's "Sacre" shows. Today we hardly have the potential for scandals. Why would you need scandals? There are of course good and bad controversies. There is far too much media and information for a day that lasts only 24 hours. That’s why many times some people think that with a scandal they can gain attention. A hundred years ago, the biggest scandals came from music: from harmony processes, from rhythmic issues. We are very far away from this now. I would like to come back to the family as target group. In Germany in most music institutions there are many educational programs: school-, family- and lecture-concerts, staged concerts, lectures. What is different about your practice? I think the educational programs are a very good thing. But you can’t do everything for everyone. You can begin working if you understand that the public is made out of people with very different needs. This certainly doesn’t work if you remain with the notion that an orchestra is an institution of the 19th Century and that it represents high culture. We used to have other conductors, and people at that time expected probably more of a dictator. But this is the 21st Century. I'd rather be a conductor like Obama: I listen, I’m open to dialogue. And the amazing thing is: the orchestra responds and the audience as well. The orchestra has started to work as a chamber music ensemble. They listen to each other, while working they develop a new harmony. The audience senses that and talks about it. That’s what I mean when I say we must serve the public. As artists we do not have to bend down to the audience. And it is nonsense to play crossover programs. Crossover is something for the industry, generating lower quality standards that are not for musicians. As an artist it is ones responsibility to pay great attention to quality, otherwise education makes no sense. The audience wants to be proud at having listened to a good orchestra. You mentioned before an analogy between the church and the concert hall. You have to be silent to concentrate. However, we need to rethink and reshape all of our roles and behaviors: musicians, artistic directors, but also you, the critics, the press. As you can see, I no longer represent the old notion that we as artists shouldn’t talk to critics. Together we all form a unit to which also the audience belongs. We need to move to a new paradigm of the concert, we are experimenting. Sometimes nothing comes out of it, but sometimes it does: We have to continue working. We need to feel that something real is happening, especially in a concert. But first comes the music. That’s what we must focus on. There’s nothing wrong with good-looking young people on stage, on the contrary, but if they have nothing else to offer, they are uninteresting. We have to take music seriously.